We won't often ask you to hit a goal like 0.0kWh in an #OhmHour, but when we do, know it's for good reason, and the grid needs your help. To help make flipping your breaker worth it, we'll give you $5 (500 points) the first time you flip your breaker and meet the goal of 0.00kWh in a MEGA #OhmHour. NOTE: If you flip your breaker for the first time in a non-MEGA #OhmHour before flipping your breaker in a MEGA #OhmHour, you will no longer be eligible for the 500 points for flipping your breaker for the first time in a MEGA #OhmHour. 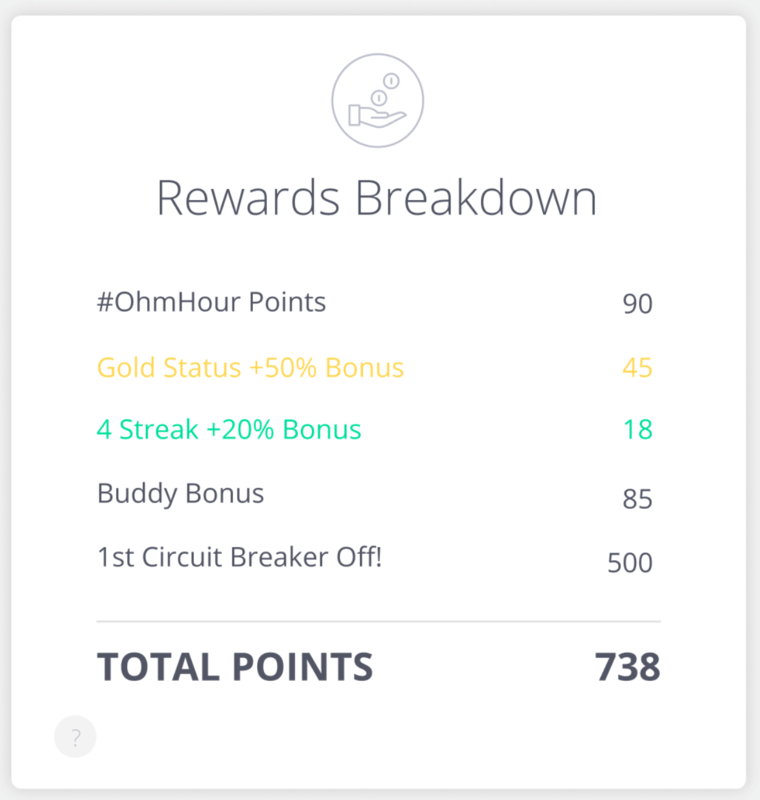 After that, every time you flip your breaker and reach 0.0kWh in an #OhmHour, no matter your actual #OhmHour goal for that event, we'll give you 500 tokens. That brings Power-up cards like Streak Shields and Baseline Boosts more within reach. We'll also give you occasional opportunities to score 500 points during special MEGA #OhmHours where we'll ask you to hit a MEGA goal of 0.0kWh. Flipping your breaker lets OhmConnect participants go the extra mile for energy reductions, and we pay you for those extra savings!